Excuses must be turned in within three days of the absence or the absence will be considered unexcused. - Students with unexcused absences may not be permitted to make up or receive credit for any tests, quizzes, class work, or homework that was to be completed during the days of absence. - After the accumulation of three (3) unexcused absences, a referral may be made to Children and Youth Services and/or the District Magistrate. - A maximum of ten (10) absences will be permitted during a school year. 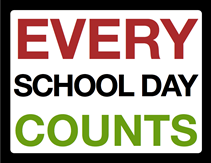 All absences beyond ten (10) days will require a medical excuse or the absence will be considered unexcused. - Any student arriving after 7:55 a.m. is considered tardy. - Each student will be permitted four (4) tardies per nine (9) week grading period. - After five (5) unexcused tardies per nine (9) week grading period, students will be subject to disciplinary action including cafeteria detention, in-school suspension, and/or bad standing. - Tardies will be considered excused if a medical excuse is submitted. - Students must present a note signed by a parent/guardian with the time of the early dismissal and reason for leaving early. - A medical excuse must be submitted upon return from medical appointments or the early dismissal will be considered unexcused. - All students leaving school early must be signed out in the middle school office. If you have any questions about your child’s attendance, you may reach Sharon Laffey by phone at (724)948-3328 X3012 or email at laffeys@mcguffey.k12.pa.us. To send a fax: (724)948-3344.